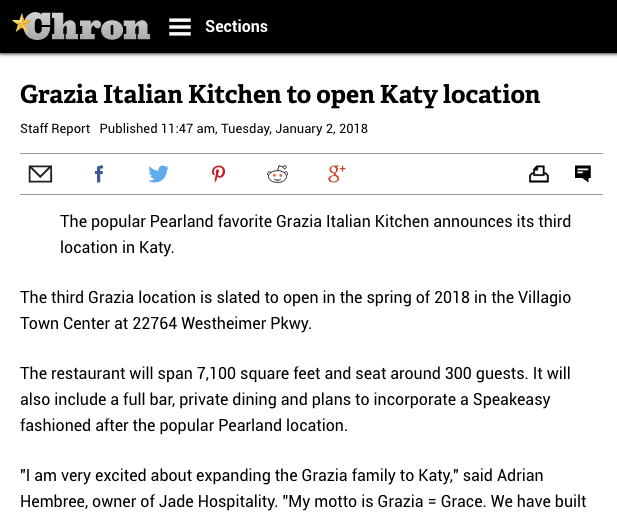 The popular Pearland favorite Grazia Italian Kitchen announces its third location in Katy. The third Grazia location is slated to open in the spring of 2018 in the Villagio Town Center at 22764 Westheimer Pkwy. The restaurant will span 7,100 square feet and seat around 300 guests. It will also include a full bar, private dining and plans to incorporate a Speakeasy fashioned after the popular Pearland location. Under the direction of Jade Hospitality’s Executive Chef Chris Loftis, the menu will feature some new culinary creations, as well as the same fresh house-made pastas, wood fired pizza, prime steaks, gulf seafood and traditional Italian favorites that guests are familiar with at the Pearland and Clear Lake locations, including their award-winning smoked short ribs. After Hurricane Harvey, the Grazia Pearland and Clear Lake locations were closed to the public, but Hembree and his team opened their kitchens to serve countless first responders and community volunteers in the immediate aftermath. In 2016, Grazia won the Lone Star Entrée Grand Champion, the People’s Choice Reserve Grand Champion and the Rookie Award at the Houston Livestock Show and Rodeo’s Roundup and Best Bites Competition for their smoked beef short rib served over pancetta risotto, topped with a cilantro molasses glaze. Jade Hospitality, L.L.C., includes Grazia Italian Kitchen in Pearland and Clear Lake.